A man was left with ‘potentially life changing injuries’ after being seriously wounded by a knifeman in a gang attack at a town cemetery. Police said a 20-year-old man was travelling home on an electric scooter when he was accosted by a group of hooded men in Western Road, Haywards Heath, yesterday evening (July 4). The gang followed him into a nearby cemetery and attacked him with a knife. He suffered serious arm injuries which, officers say, have left him with potentially life changing injuries. The attack took place at about 7.30pm. Investigating Supervisor David Bell said: “The victim suffered serious arm injuries and is understandably distressed by the situation. “We believe the group of three or four men who approached the victim may be connected to a small silver car that was spotted at the scene. The group were reported to be wearing hooded tops and had their faces covered. “If you saw this car or the assault we are urging you to come forward to us with any information you may have. 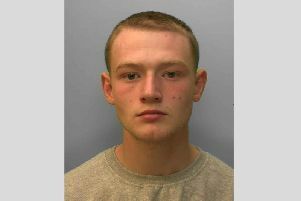 Anyone with any information is asked to call 101 quoting reference 1421 of 04/07.